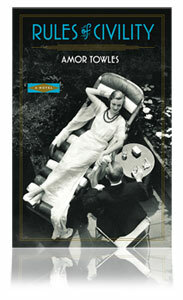 The novel selected for the 2012 “A Novel Idea” program is Rules of Civility by Amor Towles. "Set in New York City in 1938, Rules of Civility tells the story of a watershed year in the life of an uncompromising twenty-five-year-old named Katey Kontent. Armed with little more than a formidable intellect, a bracing wit, and her own brand of cool nerve, Katey embarks on a journey from a Wall Street secretarial pool through the upper echelons of New York society in search of a brighter future." This year, A Novel Idea kicks off on April 14 and culminates with two author presentations on May 4th and 5th. The first author presentation is scheduled for the Tower Theatre on Friday, May 4 at 7:00 p.m. and the second event is scheduled for Sisters High School on Saturday, May 5 at 7:00 p.m.
Tickets are free, but needed for the Tower Theatre event. Tickets will be available online (www.towertheatre.org), by phone at (541) 317-0700, or at the Tower Theatre box office during regular business hours beginning Saturday, April 14 at 10:00 a.m.
Born in 1964, Amor Towles was raised in a suburb of Boston, Massachusetts. He graduated from Yale College and received an M.A. in English from Stanford University. He is a principal at an investment firm in Manhattan, where he lives with his wife and two children. Mr. Towles is an ardent fan of early 20th century painting, 1950’s jazz, 1970’s cop shows, rock & roll on vinyl, obsolete accessories, manifestoes, breakfast pastries, pasta, liquor, snow-days, Tuscany, Provence, Disneyland, Hollywood, the cast of Casablanca, 007, Captain Kirk, Bob Dylan (early, mid, and late phases), the wee hours, card games, cafés, and the cookies made by both of his grandmothers. His first novel, Rules of Civility, is being translated into sixteen languages. The book was on the bestseller lists of the New York Times, Boston Globe and Los Angeles Times, among others. The book was also identified as one of the top ten works of fiction in 2011 by the Wall Street Journal. What would happen if everyone in Deschutes County read the same book? The benefits could be as simple as building a sense of community through discussions of a mutual interest or as complex as breaking down certain barriers within our county. Whatever the outcome, “A Novel Idea...Read Together” celebrates the importance of books and the role they play in our diverse community. Past A Novel Idea authors include Khaled Hosseini, David James Duncan, Maria Amparo Escandon, Kenny Moore, Dara Horn, Lauren Kessler, Kathryn Stockett, and Teddy Wayne.